Continuing our reprise of this year's most popular posts with Advertising Needs A Big Slap Across The Face With A Large, Wet Fish..
Advertising needs a big slap across the face with a large, wet fish. We have become confused about what 'craft' or creativity is in advertising. Advertising creative craft at its best isn't merely styling, or thinking up a funny or entertaining thing with the product somehow involved – yes they are things that many amateurs or "kids in Australia" [reference to a Doritos ad] can do. But that isn't good advertising creative craft, and probably that Doritos ad isn't really good advertising, it's just funny, or entertaining. Proper, great, advertising creative craft is about searching for that thing in the product or service that will mean something to the consumer, it is about understanding what the consumer wants, what will motivate them, understand how people work, how they decide, and putting all this together in compelling ways that show the consumer what's in for them, in ways that are engaging, interesting, unexpected, relevant, intelligent and memorable, that are robust and enduring, that build companies and grow brands over time by getting more people to buy more product or service more often. That is advertising creativity. It is only because we underestimate and misunderstand what real advertising creativity is, that we think "anyone can do it". Proper advertising creativity isn't just creativity. But the industry has downgraded a whole generation of creatives to merely being being stylists and producers of branded entertainment. Advertising will not get itself out of the confusing fug it is in until we reverse that trend and remember what proper advertising creative craft is, and understand and re-engage with the value it can give to business, be proud and confident about it, and put that thing back in the centre of the business. There's an interesting conversation (argument, debate, call it what you will) taking place in advertising at the moment. And the great thing is, it isn't about holding companies or digital versus traditional or any of those boring old things, it's about advertising. And how advertising works best. I've got to get my cards on the table early here, I don't think there is a one-size-fits-all, one-way-to-do-advertising that is right for every product, brand, category and business problem. And I have a problem with those people who insist there is. I don't think it's very smart, and it makes the advertising industry look a bit stupid. I think you should start with the business problem, the situation of the client, and what they are trying to achieve, and let that be your most important jumping-off point. Not your own ideology that you force the problem to fit into. It's tempting for agencies to have a dogmatic approach to problem solving, because it gives them something interesting to say to clients - but as the saying goes the hammer always sees the nail. Having abstract debates about advertising ideologies can be a bit, now how can I put this… boring and pointless? So I'm going to use an example to help. I think this was one of the most highly awarded ads of recent times. Most people I speak to agree that it's really good, but, interestingly, don't necessarily agree on what makes it good. That's a strange situation right? We all agree it's good advertising, but we don't all agree on what makes it good advertising. Maybe that shouldn't come as so much of a shock? One thing I've noticed over the years is that there are quite a lot of people out there in advertising – talented, clever people who do good work – who don't even get what makes their own work good, so why should we be surprised when they can't agree on what makes someone else's work good? There's a school of thought that says that this Volvo commercial is good because it's entertaining - we want to watch it because Van Damme is a funny/weird bloke, and he's doing the splits, and there's a funny voiceover etc. That we should just do entertaining, funny stuff that people like, and that will make ads good. That the job of the ad is simply to be noticed and enjoyed. They tend to think that the rational message in the ad is unimportant – in fact often gets in the way. That an ad that is entertaining and enjoyed is a good ad. We like the ad, therefore we like the brand, therefor we are more likely to buy from that brand. There's another school of thought that says what makes this ad good is that it makes us feel something. This notion is very fashionable at the moment in advertising. Some recent, very compelling, theories in human psychology and neuroscience suggest that humans make decisions largely for emotional reasons, that rational thought plays very little part in the process, at best that we post-rationalise decisions largely made emotionally. 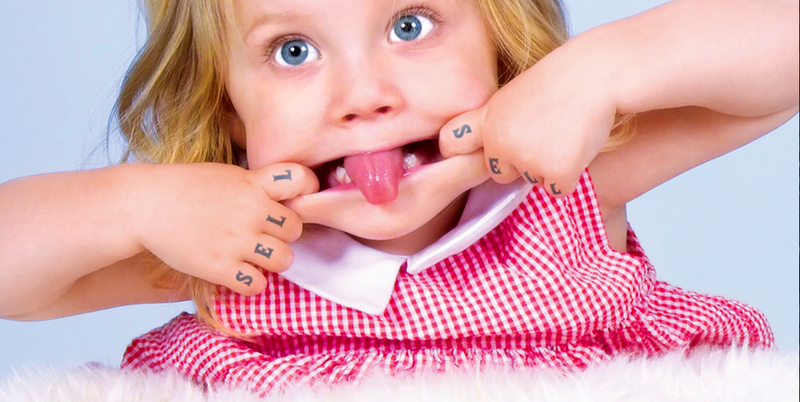 This approach to advertising says that you only need to make people feel something. Again, to these people, product and benefits don't come into what makes it good, in fact they are superfluous. This theory says that because the ad makes us feel fear for Mr Van Damme, this makes for effective advertising because that emotion will affect our decision making when it comes to buying a truck. And there's another school of thought. That what makes this ad good is that it takes something that is a genuinely important, relevant feature of the product, and demonstrates it in a way that is entertaining, makes you remember it and distinctive. That what makes the ad so good is that it does two things well - it communicates a piece of information of value to the watcher or potential buyer – and it is unexpected, entertaining, fun to watch and memorable in the way that it does it. These people would say that the product and the rational message is key to what makes it good, without that, it wouldn't be a great ad. I have to say, when it comes to this commercial, I am firmly in the latter camp. I think the product feature being dramatised here is important to truck drivers, and important to truck buyers (these people might not be the same). Let's think about someone about to make a decision about buying a truck, or trucks. They are likely to be either an owner-driver or a fleet buyer. That means that either way, this purchase will be a huge investment with a lot riding on it. Either possibly the second-most expensive thing the person has ever bought, that they will use every day of their working life, or a massive investment for their company that they will have to justify. Either way, regardless of the fashionable thinking, I don't think that will be a purely emotional decision. Can you imagine the fleet buyer of a haulage or logistics company saying to his CEO that he spent 1.5m of that company's money based on a feeling? I doubt it. The emotional camp might say to us that he's just post-rationalising to his boss. But that would mean that having a rational point to hand to use post-decision would be important to his decision. Which means that the rational point was important to communicate in the commercial. I don't think the commercial would be anywhere near as good if it didn't communicate that rational product point. But I don't think it would be anywhere near as good if didn't do it in a way that's unexpected, entertaining and memorable. A straight demonstration of the truck's reversing capabilities would have shown what it could do. Say, a truck reversing down between two lines of road cones - that would effectively be demonstrating the same thing - it's easy to reverse in a straight line and control going backwards. But that wouldn't be interesting enough to keep the viewer's attention, and it wouldn't necessarily stick in the mind of the buyer (unless that reversing capability was of particular interest or importance to that person). The jeopardy of Van Damme's crotch being at the mercy of the truck's reversing capabilities does these things brilliantly - it brings the benefit to life, and it's an image likely to stick in your head (and an image with giant products in it too). It takes the benefit of the product (a rational point) but it demonstrates it in an arresting, unexpected way. It uses jeopardy - we worry about the wellbeing of the chick. It wouldn't be anywhere near as effective if the ad had just shown a thermometer being placed in the canister. So the jeopardy is clearly important to the Volvo ad being great - but on it's own jeopardy wouldn't make the ad great. Let's imagine it for a minute without the product benefit. What we have is the fear of Van Damme falling or hurting his famous crotch. So we could have him say, doing the splits over a ravine, or doing the splits over two concrete blocks in mid-air. Then just stick a Volvo logo on the end. That would be an ad that had the famous bloke, and the splits and the fear of him falling or hurting himself. It would do what the feelings people think is the important bit, it would make us feel an emotion. But it wouldn't communicate anything about the truck, or the what makes it a good truck. Thinking back to our truck buyers above, I don't think that would make it anywhere near as effective a commercial. So that makes the rational part of the ad, and the product, important to what makes it a great ad. And I'd say the same to our first group – they think what makes it a great ad is how entertaining the commercial is. They don't think the product point is important. They think us liking the ad is the important bit. You have Mr Van Damm dancing around maybe, maybe throw in a CGI animal or baby, use a funny or catchy song. Then stick the Volvo logo on the end. That would probably be a hella entertaining ad. But it would be a highly entertaining, not very useful, not very good, ad. What is pretty certain is that this debate, in the broader sense, will rage on, not least because people have their own biases. Some would rather be doing work that is just entertaining, after all it is fun – and it's hard to find genuinely useful things to say about a product, let alone then make that interesting. And some people no doubt would rather feel like their work is more clever than simply letting people know why a product might be of benefit to them. And some, quite rightly are just trying to work out what is best to do for their particular client, in their particular category. So I think it's a positive thing for the business to have these debates out in the open, and it's important for creatives, especially young creatives, to get involved in these discussions (creatives – don't leave it to the planners, you are the thinkers of the business). In general I'd say be wary of anyone who tells you there is one right way to do all advertising. 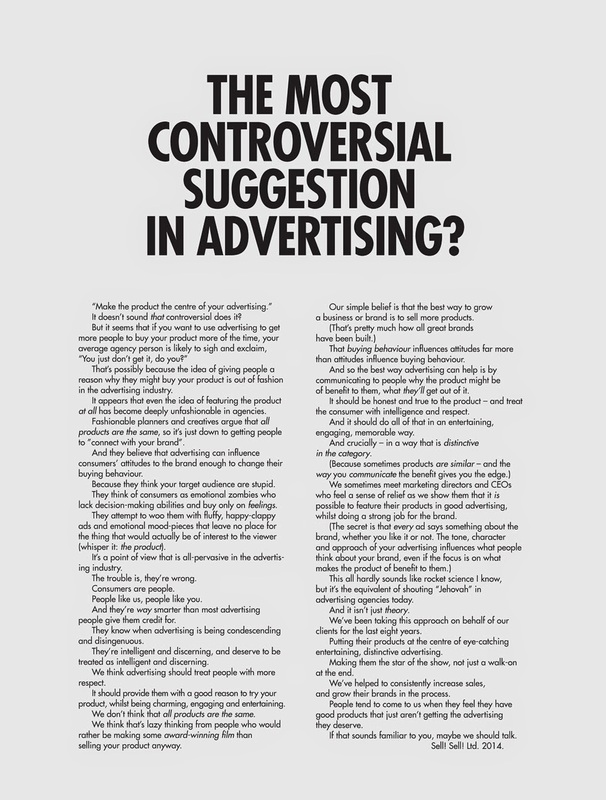 The Most Controversial Suggestion In Advertising? That’s possibly because the idea of giving people a reason why they might buy your product is out of fashion in the advertising industry. It appears that even the idea of featuring the product at all has become deeply unfashionable in agencies. Fashionable planners and creatives argue that all products are the same, so it’s just down to getting people to ”connect with your brand”. And they believe that advertising can influence consumers’ attitudes to the brand enough to change their buying behaviour. Because they think your target audience are stupid. They think of consumers as emotional zombies who lack decision-making abilities and buy only on feelings. They attempt to woo them with fluffy, happy-clappy ads and emotional mood-pieces that leave no place for the thing that would actually be of interest to the viewer (whisper it: the product). It’s a point of view that is all-pervasive in the advertising industry. The trouble is, they’re wrong. Consumers are people. People like us, people like you. And they’re way smarter than most advertising people give them credit for. They know when advertising is being condescending and disingenuous. They’re intelligent and discerning, and deserve to be treated as intelligent and discerning. We think advertising should treat people with more respect. It should provide them with a good reason to try your product, whilst being charming, engaging and entertaining. We don’t think that all products are the same. We think that’s lazy thinking from people who would rather be making some award-winning film than selling your product anyway. Our simple belief is that the best way to grow a business or brand is to sell more products. (That’s pretty much how all great brands have been built.) That buying behaviour influences attitudes far more than attitudes influence buying behaviour. And so the best way advertising can help is by communicating to people why the product might be of benefit to them, what they’ll get out of it. It should be honest and true to the product – and treat the consumer with intelligence and respect. This all hardly sounds like rocket science I know, but it’s the equivalent of shouting “Jehovah” in advertising agencies today. And it isn’t just theory. We’ve been taking this approach on behalf of our clients for the last eight years. Putting their products at the centre of eye-catching entertaining, distinctive advertising. Making them the star of the show, not just a walk-on at the end. We’ve helped to consistently increase sales, and grow their brands in the process. People tend to come to us when they feel they have good products that just aren’t getting the advertising they deserve. If that sounds familiar to you, maybe we should talk. One of the greatest TV shows of all time is being remastered in HD and being re-run on HBO. If you're a fan of The Wire and interested in how they shot it, David Simon has written a good article on the process of converting the film from 4:3 to 16:9 and the pros and cons of doing so. Despite William Fowler's tweet (very funny sir), I am about to do exactly that. 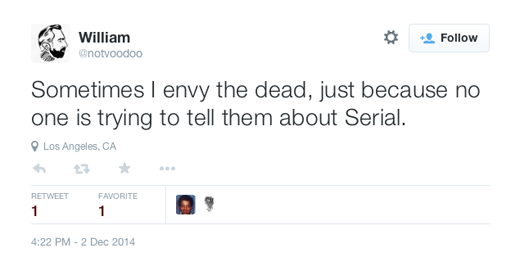 For those who haven't come across it, Serial is a podcast from the creators of This American Life. 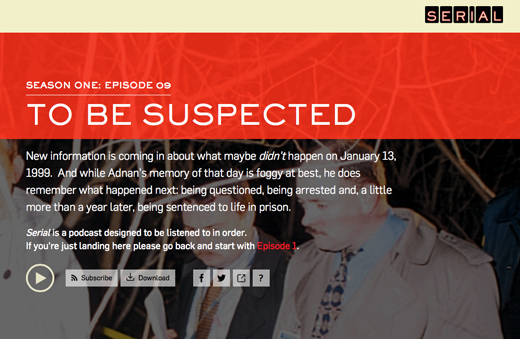 Hosted by Sarah Koenig, it tells the true story of a journalist's investigation into the 2000 trial and conviction of the then 18-year-old Adnan Syed for the murder of his former girlfriend Hae Lee. The series is up to episode nine (the tenth is out tomorrow) and is pretty addictive, compelling listening once you get into it. You can find out more, and listen to all of the episodes to date, here. We're massive fans of the tandoori delights at the marvellous Tayyabs in Whitechapel. Who'd have thought that one of its legendary lamb chops would ever end up in space? Maybe only Nikesh Shukla who organised this stunt to promote his book Meatspace. Regardless of all the publicity it delivered I can't help thinking that it's sacrilege to waste a Tayyabs lamb chop in this way. 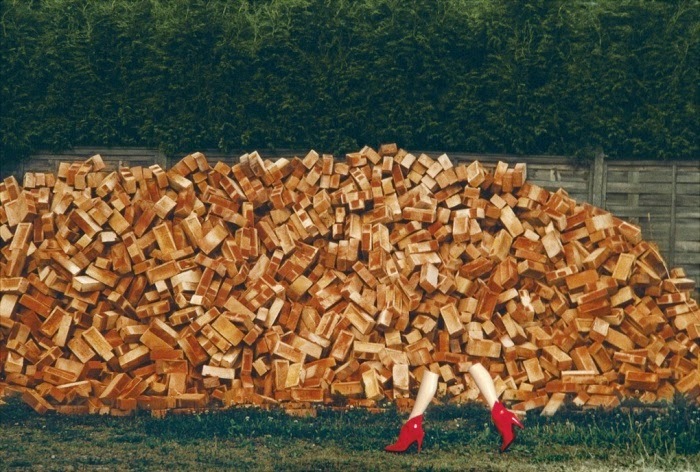 Somerset House recently opened their doors to the largest collection of Guy Bourdin's work the world has ever seen. I made a visit over the weekend and it's really, very, really, very good. With lots of large prints, some behind the scenes scamps and polaroids it's easy to spend a couple of hours there. Get some. Oh, and check out Dave Dye's great post on ze extraordinary frenchman.